Carlos Coppel Pérez-Herrera (A Coruña, 1990) studied Biology at the Universidade de Santiago de Compostela achieving his graduated in 2014. He obtained a Postgraduated in Medical Genetics in 2015 at the Universitat de Valencia. 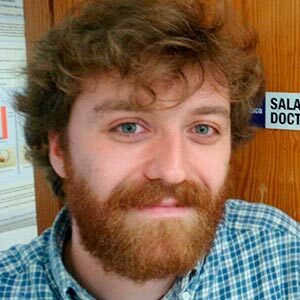 In 2016 he completed a Master Degree in Molecular and Cellular Biology and Genetics at the Universidade da Coruña focusing his Master's project in the identification of the interactome of HMGB1 in prostate cancer. Carlos Coppel is currently working at the department of Zoology, Genetics and Anthropologie, with the supportment of the Xunta de Galicia in the "Principia Programme" at the Universidade de Santiago de Compostela in the Campus Terra in Lugo. At this moment he is carrying out studies in toxicity with Rutenium compounds, studying embryonic ageing of zebrafish model, and performing xenograft with different kinds of cell lines.